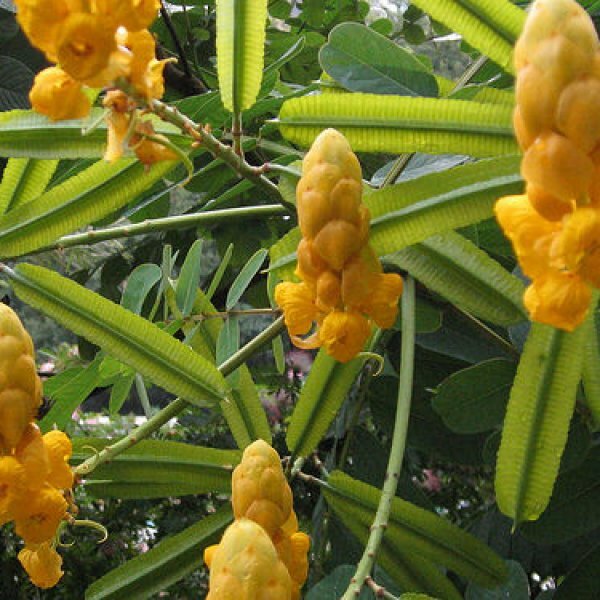 Large, lush and blessed with gorgeous candles of golden yellow flowers, this tropical, evergreen shrub is also a desert garden favorite. 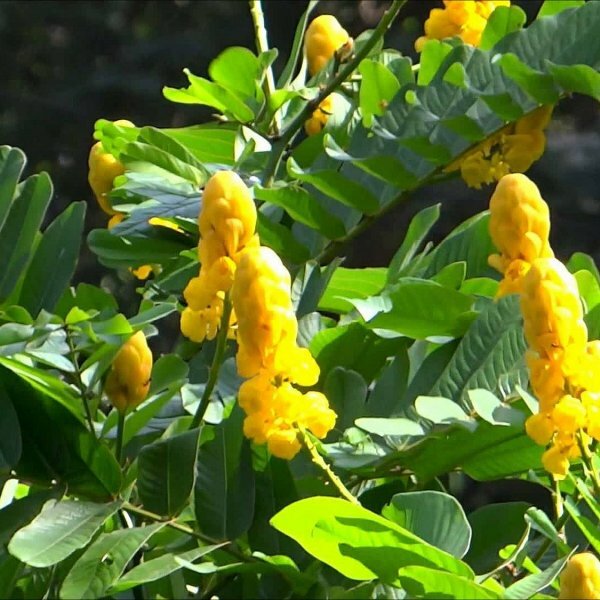 It is native to well-drained soils of Tropical America, but has proven perfect for the Old World tropics, dry, or warm temperate climates that are frost-free or have mild but frosty winters. 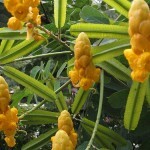 Large, compound, green leaves offer a lush background to the brilliant tropical flowers. 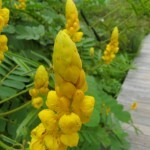 This is a useful midsummer bloomer that holds its color well into the fall where the climate is warm enough. The tall spikes of yellow flowers are held at the branch tips, so they remain highly visible and attract butterflies. This species has proven somewhat invasive where the climate favors germination of its seeds. 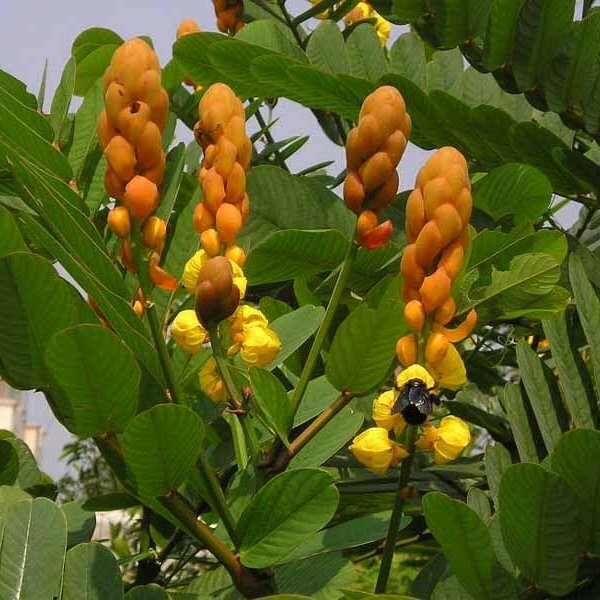 Grow the Empress candle plant in full sun and almost any well-drained soil It does not require highly fertile soil, but becomes quite lush and fast-growing with ample water and fertilizer. It is on the cusp between a large shrub and a small tree; in regions with light winter freezes it is killed to the ground and rejuvenates like a perennial in late spring or seedlings sprout to become new plants. Use it for a fast-growing screen or hedge. Otherwise, how it serves a landscape may be strictly defined by how it is trimmed. (info source: Learn2Grow.com). Germination Germination: 21-30 days. Sow on the surface of lightly firmed, moist seed compost in pots or trays. Cover seed with a sprinkling of compost or vermiculite. Keep at a temperature of between 60-70„aF. After sowing, do not exclude light as this helps germination. Keep the surface of the compost moist, but not waterlogged. When large enough to handle, transplant seedlings into pots or trays. Gradually harden off before planting out after all risk of frost, 6 feet apart. For best results in northern regions, grow in containers of soil-based potting mix in greenhouse or conservatory. Feed with balanced liquid fertilizer February-May. Water sparingly in winter. Top dress or pot on in spring. Exposure: Full sun.